It is 4.00 am on Thiruonam Day. Chingam, the first month of the Malayalam calendar has dawned. After the build-up of excitement and preparation of nine thrilling days, there is a rush to wake up....This is one of the enchanting images of Onam for every Keralite. The sky is brighter and air has been fragrant for the past ten days because the monsoon months have just ended; flowers are abundant everywhere...There is food in plenty and new clothes are a must. Beautiful floral decorations are laid out in front of every house, with white thumba and yellow mukutee flowers - auspicious symbols of purity and peace. On the actual day, rice pancakes are kept ready for a revered guest from the netherworld, a brigand demon king who ruled the land once upon a time and flowers are strewn on the pathway of every house. Massive swings hang from the tallest branches of the tamarind or the mango tree, there are games of football in every village and young girls dance the kaitottikalli to hypnotic rhythm around gleaming brass oil lamps late into the night. Aeons ago - so the legend goes - the fierce warrior Parashurama during his many wanderings in search for a place fit to be an abode for celestial beings, crossed the Vindhya Mountains (in central India) and arrived in present-day southern Karnataka. He stood atop the Gokarna Hill and gazed outwards at the azure blue and green of the Indian Ocean, then flung his weapon, a silver axe - commanding the waters to make way. The ocean foamed and frothed and decked in rich green, with its beautiful valleys and mist-covered mountains, its beaches and lagoons, its meandering rivers, its lush rice paddies and rainforests, flowers and animals and its unique fruits and spices, Kerala rose and nestled closed to the mainland- from Gokarna to Kanya Kumari (the southermost tip of India where the Indian Ocean, the Arabian Sea and the Bay of Bengal meet in a riotous colour of sand and water. Parashurama named the land 'Kairali' (for a maiden who was the daughter of Jaambavan, one of the monkey-heroes of Indian mythology) - which is today's Kerala, comprising the erstwhile states of Malabar, Cochin and Travancore - home of the Malayalam-speaking people, the Malayalees. Kerala is one of the smallest states in the Indian Union, with only one per cent of its landmass, but its influence over the Indian subcontinent has been wide-ranging and far-reaching over the centuries. From colourful people's theatre, martial arts and the flourishing Ayurvedic system of medicine to literature, films and folk arts, politics and modern science and information technology, Kerala has remained a torch-bearer. The list is almost endless. Insulated as it is from the rest of India by the Western Ghats (mountain range), and open to the wide ocean and influences of distant civilizations, the land and its people developed its own uniqueness and own way of life along with distinct traditions and festivals. The philosophical father of modern-day Hinduism, Adishankara - Shankaracharya - was born in the village of Kaladi in Kerala (and in recent times Swami Chinmayananda - born as Balakrishnan Nair in Kerala) took the Hindu discourse into the international sphere. Christianity came to Kerala long before the world had heard of Jesus Christ, and was said to have been brought by Apostle St. Thomas, and was soon entrenched in southern India. Unlike the northern parts of India, where foreign Islamic armies invaded, battled and defeated local rulers and plundered and pillaged Hindu temples and fabled cities, Islam came to Kerala through trade - led by Arab merchant-princes of the Persian Gulf region who still have a fascination for Kerala. The Zamorins of Malabar (called Samuthiris in Malayalam) allowed the Arab traders to settle in Kerala and marry local girls and granted them land to build their own places of worship. 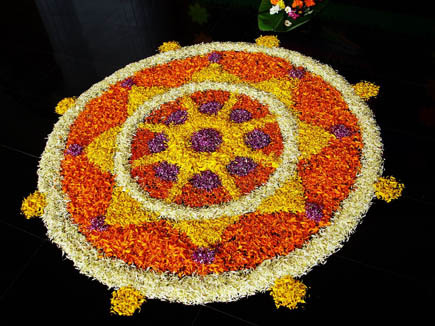 One of the unique festivals that developed outside of religious influences, Kerala's harvest festival of Onam is now becoming an international festival, celebrated with great joy and community participation in the Malayali diaspora. Mahabali was an emperor who ruled the three worlds from his throne in Kerala. He was the son of Veerochana and grandson of Prahlad, the devout son of demon King Hiranyakashyap. Mahabali had a son called Bana, who became a legendary king in his own right and became known sd as Banraj in central Assam. Mahabali belonged to the Asura (demon) dynasty but was an ardent worshiper of Lord Vishnu. The land was prosperous and his subjects revered him for his benevolence, his idealism and concept of justice (which are invoked in day-to-day conversations even today). The Gods above were jealous and couldn't tolerate this worship of a demon king and plotted to banish him from this earth. They then sent a divine emissary - Vamana - just three feet high, who asked the king for three-foot lengths of territory. Mahabali knelt with bowed head and said:"Sire, you can place your foot here...." and he was pushed gently into the darkness of deep and everlasting oblivion. As a gesture to his grief-stricken subjects, Vishnu told Mahabali that he could visit his people once a year ...on a full moon day, just after the thunderous south-west monsoon abates. It is to welcome King Mahabali that Malayalees arrange the floral decorations and keep rice pancakes for his repast, although on the actual Onam day, there are no decorations done. Up to 24-course vegetarian dishes are readied so that the King sees it and returns happy to his eternally dark world- with the knowledge that his subjects are still prosperous. The traditional festivities, including the great dances, have been handed down from generation to generation, and there are few Malayalees who do not know several lilting Onam festival songs. 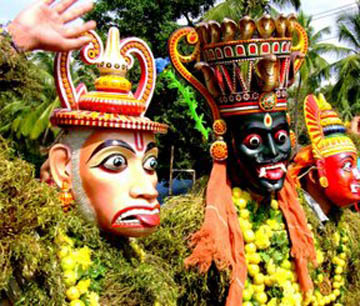 Today, Onam has also been adopted by the Kerala state government which has made it a popular tourist event. 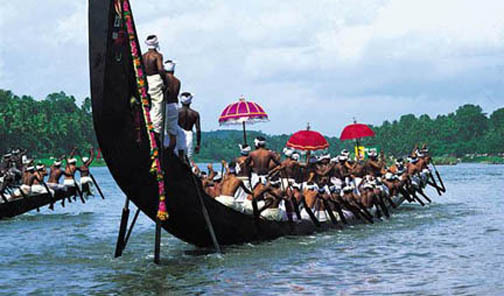 The grand snake boat races - with at least 80 oarsmen on each vessel - take place during the Onam season. 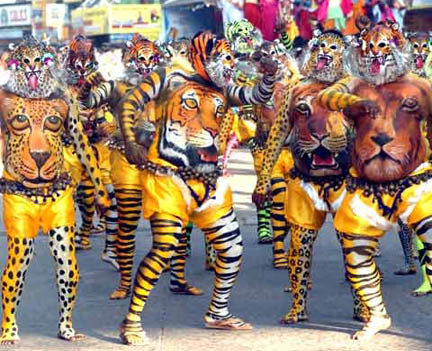 These include the famous Champakulam (in July), the Nehru Trophy (on August 14), the Payippad, near Harippad in Alleppey district famous for its canals, and the fabulous Aranmulla race on the fourth day after Thiruvonam. After the sumptuous meals and the four days of celebrations, the come-down to the real world is generally an anti-climax for all Malayalees. The realities of life beckon but with the greetings that have been exchanged and the general goodwill, another year quickly passes, for both King Mahabali and his subjects ...until everybody gets together again. Times of India Group in Bombay, India. Theyyam oxr Theyyattam is a popular ritual dance of North Kerala state, India, predominant in the Kolathunadu area (consisting of present-day Kannur and Kasargod districts). As a living cult with several thousand-year-old traditions, rituals and customs, it embraces almost all the castes and classes of the Hindu religion in this region. 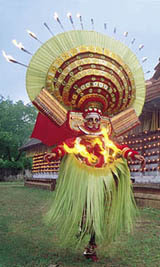 The term Theyyam is a corrupt form of Daivam or God. People of these districts consider Theyyam itself as a God and they seek blessings from this Theyyam.A similar custom is followed in the Tulu Nadu region of neighbouring Karnataka known as Bhuta Kolaear.